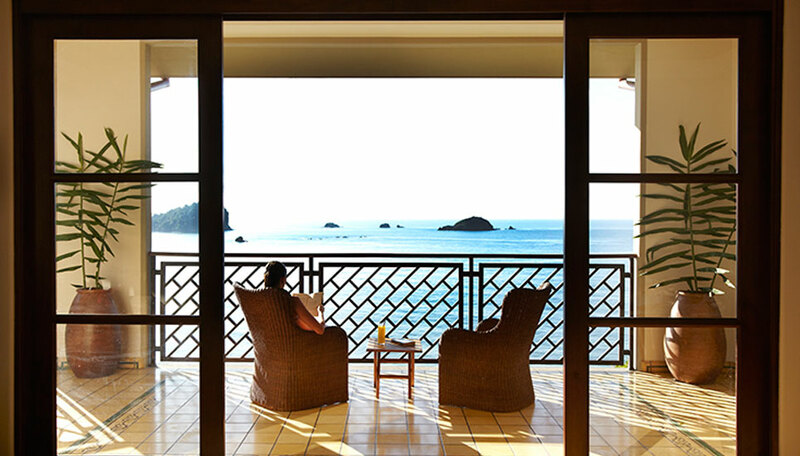 Arenas del Mar is Manuel Antonio’s only luxury beachfront property and the first hotel in Costa Rica to gain a perfect rating of five-star in luxury and sustainability. Manuel Antonio beach 5kms from Quepos, Central Pacific region. Arenas de Mar is open year round. 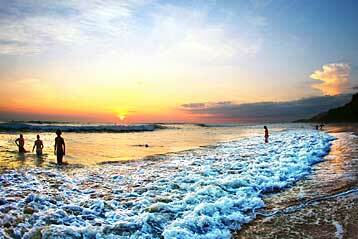 Facing 2 lovely white sand beaches and flanked by dense rainforest, Arenas del Mar has an enviably perfect location. 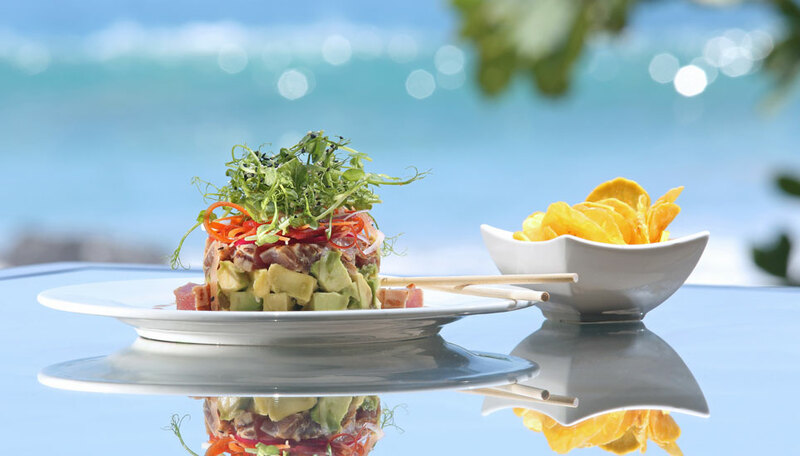 Combine this with sumptuous accommodation, creative cuisine, 2 swimming pools, a top quality spa and you might never want to stray beyond the confines of the hotel. 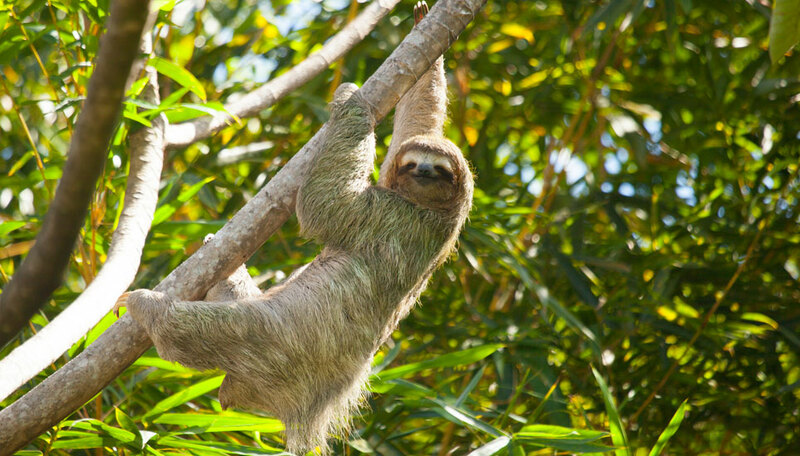 But with the lush rainforest and rich wildlife of Manuel Antonio National Park a stone’s throw away you’ll certainly be tempted to explore. The variety of plants and abundance of animal and bird life is dazzling. Add to that the thrills of a canopy tour, watching impossibly vividly coloured frogs in an aquatic garden, opportunities to go surfing, whitewater rafting and kayaking, and your days can be as action packed as you wish. With so much choice and so many attractions it’s easy to see why Arenas del Mar is popular with people of all ages. Why go to Arenas del Mar? 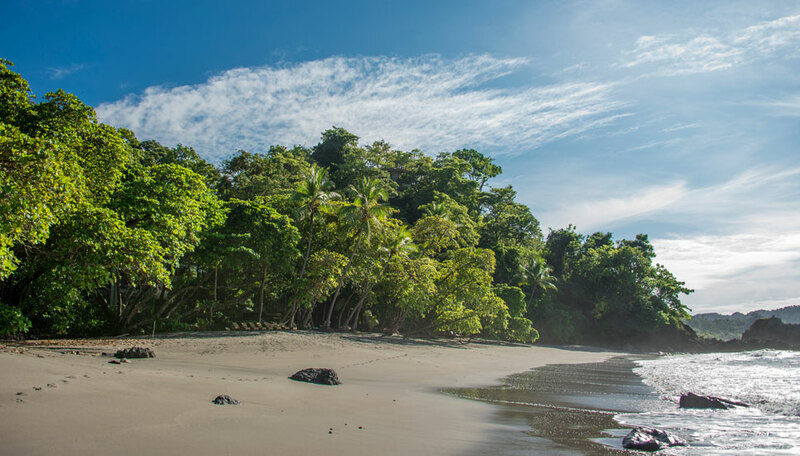 If you want to experience the wildlife of the rainforest and the beauty of some of Costa Rica’s finest beaches while enjoying top quality accommodation and facilities, Arenas del Mar is the place for you. 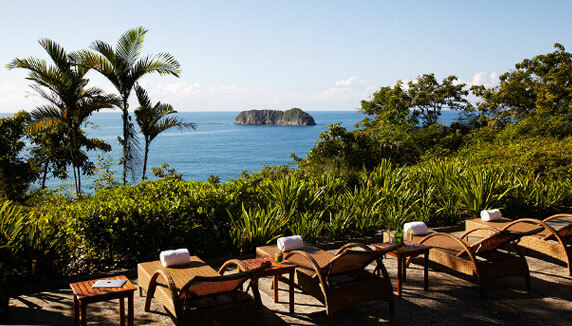 Within walking distance of Manuel Antonio National Park, this luxury lodge offers a broad range of activities to delight nature lovers and plenty of pulse-quickening adventures such as surfing, whitewater rafting and canopy tours to please thrill seekers. With a choice of restaurant and bars, gourmands, too, will be in their element. 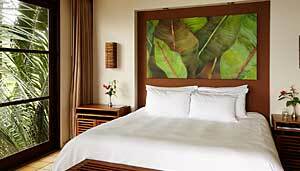 Arenas del Mar is nestled in a rainforest with wildlife aplenty, including a rich bird population of some 180 species. The hotel has 2 resident naturalist guides available at all times to answer your questions and lead you out into the different habitats to make sure you get the most out of your experience. The trees, bushes and flowers planted just outside your room were specifically chosen because they attract different species of tanagers, euphonias, flycatchers, robins and woodpeckers. It’s not all birds, though, and you’re highly likely to observe monkeys, sloths and agoutis as you stroll in the hotel grounds. Children of all ages are welcome, and is especially recommended for those aged 6 years and upwards. Children aged 12 and under stay free of charge. The lodge offers various activities for children such as guided walks on nature trails, visit to the butterfly gardens, boat excursions.. There is free Wi-fi throughout the property. All rooms have telephones to place and receive free local and international calls. There are 38 rooms and suites in 5 different categories. All have king size beds, air conditioning and ceiling fans, Wi-Fi, telephone, TV, coffee maker, minibar with local snacks and drinks, safe, en-suite bathroom with shower and a supply of locally-made organic toiletries. Ocean View Premium Suite (11) – these suites are on the 2nd and 3rd floors and consist of a bedroom, spacious living area equipped with a full-sized pull out sofa bed and DVD player, a kitchenette with dining table, and 2 bathrooms, each with a shower. Outside there is a large covered deck with a tiled hot tub and wonderful views of the Pacific Ocean and Manuel Antonio National Park. Each suite accommodates up to 3 adults or 2 adults and 2 children. Ocean Breeze Suite (10) – these are on the 1st, 2nd and 3rd floors and their facilities are almost identical to the Ocean View Premium Suite, the main difference being that these suites have just 1 bathroom, and that the terrace and hot tub look out over the rainforest towards the ocean. Each suite accommodates up to 3 adults. Ocean View Superior Rooms (7) – these are arranged next to the Ocean View Premium Suites and have a large bedroom, DVD player, spacious bathroom with tiled shower and a private covered deck with an outdoor kitchenette and a comfortable seating area. These rooms have the same ocean views as the premium suites. They sleep 2 people. Ocean Breeze Superior Rooms (8) – these are on the 1st and 2nd floors and have the same facilities as the Ocean View Superior Rooms, the main exception being that the deck overlooks the rainforest, which makes it great for bird and monkey spotting. They sleep up to 2 adults. Garden Rooms (4) – each room has good sized bedroom, a bathroom and a small outdoor terrace. They accommodate 2 people, though some also have room for a sofa bed that can sleep up to 2 small children or 1 adult. There are some sets of connecting rooms. These consist of an adjoining suite and room of the same type (eg an Ocean View Premium Suite and an Ocean View Superior Room, or an Ocean Breeze Suite and an Ocean Breeze Superior Room). Together they provide more than 150sqm of living space with spectacular ocean, rainforest and beach views. These interconnecting rooms can accommodate up to 5 people comfortably.